I feel obliged to warn you, that if you are trying not to spend money, do not, I repeat DO NOT under any circumstances, go into Zara! I was on a bit of a roll in regards to restraining my spending, but alas... it all went rather wrong during last week. 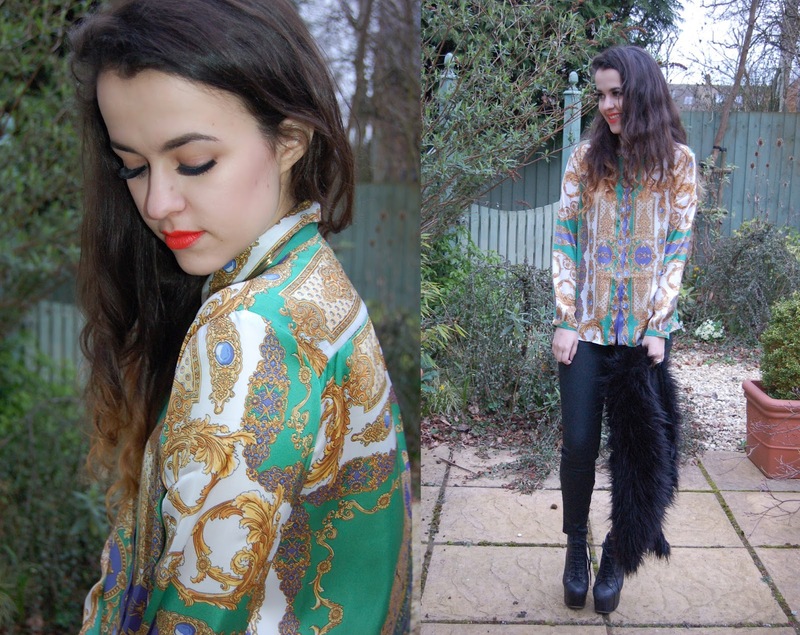 The silk shirt and leather trousers are both from Zara and were both quite inexpensive! I only have a few pieces from Zara and would not generally consider myself a fan, but I have to admit, they are swaying me and I was very impressed! So if you're looking for a few new spring-appropriate bits and bobs, definitely go and have a gander. Great outfit, and I know what you mean about Zara, I always want too much! the shirt is so cool! theres not a zara were i live so im safe! It looks like a really cool store though. Love this outfit! You're right Zara is amazing at the moment, I have to stop myself from going in because I know I'll just spend and spend! My grandma handed a few shirts like this to me recently. She told me to throw them away. Not happening. 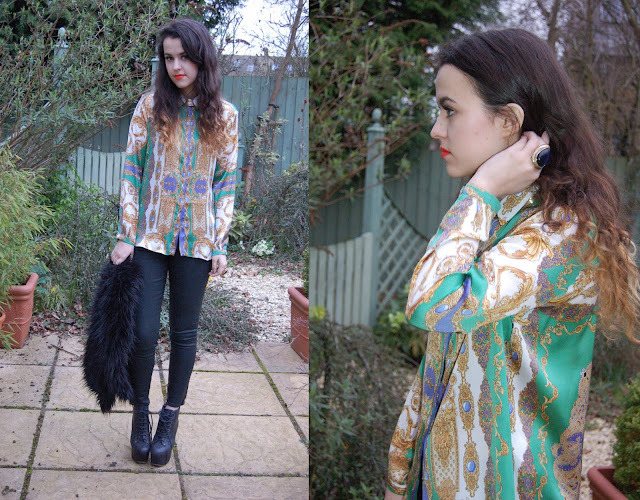 this baroque shirt is to die for. Beautiful shirt - think I may have to take a trip to Zara soon! love the shirt! saw it in zara as well last week but couldnt bring myself to purchase it..
What size shirt is this? I can never tell with Zara sizes whether to get a S or M! Would be great help, thanks! Zara has been my downfall too! I've literally not bought anything this year, except from two Zara tops, it's quite bargainous in there though so its ok! Really love this shirt and the trousers look great, when I have a bit more disposable cash I will be going back! Awww yay show us the puppy, full posts, random photos whatever!! Zara is incredible at the moment! Every time I go in there I want to buy SO much, even their TRF collection is really good at the moment. 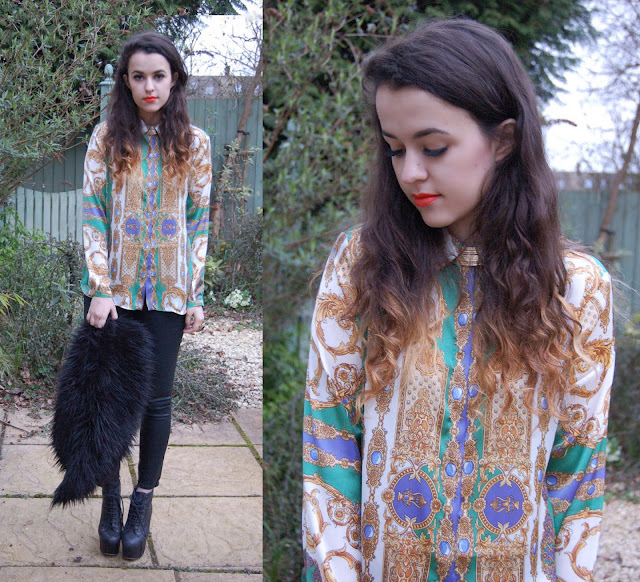 Love the bright lipstick with the print shirt! You look so good. We love it! that shirt is amazing and you look so beautiful. love your shirt and your style! Lvoe this shirt its gorgeous!